The Euro to Canadian Dollar (EUR/CAD) exchange rate has risen today despite circumstances working against the advance of the common currency. The Euro (EUR) has advanced by 0.4% against the Canadian Dollar (EUR/CAD) today, a significant improvement on the marginal gains that it made earlier. The gain comes in spite of uncertainty over the Greek bailout damaging the Euro’s overall performance, and the Canadian yearly and monthly New Housing Price Indices for June both showing slight growth. The likely cause of this decline for the Canadian Dollar (CAD) is the US Advance Retail Sales figure for July, which matched the predicted 0.6% increase. US Data is likely to hold further misfortune for the ‘Loonie’ tomorrow, as the University of Michigan Confidence survey for August is impending, and has been forecast for a 0.5 point increase up to 93.6 points this month. Eurozone data is also sure to push the Euro higher against the ‘Loonie’, as the Q2 GDP results are due from a large number of Eurozone countries. Even if a slight overall growth is recorded, this is predicted to widen the disparity in the GBP/CAD pairing. With this in mind, any unexpected delays or setbacks regarding the Greek bailout will, in all probability, send the Euro plunging back down in the CAD/GBP pairing. The Euro to Canadian Dollar (EUR/CAD) exchange rate has fallen today, as further delays in the Greek bailout negotiations have caused the common currency to soften. The Euro (EUR) has fallen against the Canadian Dollar (EUR/CAD) since yesterday, and is now trending in a narrow range. This comes after doubts were raised over whether Greek bailout negotiations will actually be concluded tomorrow, as they have been expected to. Before Eurozone finance ministers in Brussels decide whether or not to approve the document, it must first get through the Greek Parliament overnight. Although Prime Minister Alexis Tsipras’ Syriza party is expected to be broadly supportive of the plan, the hardliners consider the draft to be a ‘noose around the neck’ of the population of Greece, and are unlikely to go quietly. 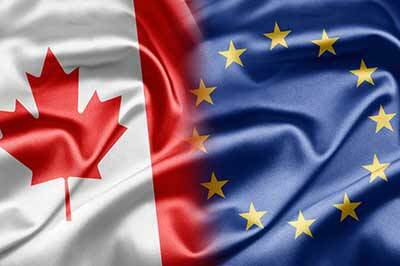 However, the Euro may regain its previous advantage against the Canadian Dollar (CAD) if the US Advance Retail Sales figure for July (released today) comes in above the optimistically forecast 0.6% increase. As the Euro has destabilised, the US Dollar (USD) has returned to strength; this has in turn devalued the ‘Loonie’. The Euro to Canadian Dollar (EUR/CAD) exchange rate has risen today as the ‘Loonie’ (CAD) continues to face problems from all sides. The Euro (EUR) has risen by 0.2% against the Canadian Dollar (EUR/CAD) today, as the Greek government announced this morning that they were looking to close bailout negotiations by Thursday night, with a possible extension into Friday morning being considered. Such an abrupt end to over a month of discussions and compromises has been welcomed by speculators, and the Euro has enjoyed a three-day uptrend against its rivals this week. The Euro has gained by over 0.8% against the South African Rand (EUR/ZAR), the US Dollar (EUR/USD) and the Pound Sterling (EUR/GBP) today, and has seen a more significant rise of 1.8% against the Indian Rupee (EUR/INR). This uptrend hasn’t been dampened by the Eurozone yearly Industrial Production figure for June, that showed a 1.2% increase instead of the forecast 1.7% growth. The Canadian Dollar (CAD) has had a mixed performance today, seeing a -0.2% decline against the Euro (CAD/EUR) being offset by a 0.8% increase against the Pound Sterling (CAD/GBP) and the US Dollar (CAD/USD). This comes at a time when uncertainty rages over what the future holds for Canada’s economy. The Canadian Housing Starts data for July was released yesterday, and showed a 193K increase in the figure; although this was below the predicted 195K increase and the previous total of 220.3K, the results still indicated positive growth for the Canadian economy. However, the value of the Canadian Dollar was damaged considerably by the devaluation of the Chinese Yuan (CNY) by almost 2% yesterday. This slowdown of the Chinese economy has spelled trouble for Canada’s commodity exports, which are already struggling with record low prices. The Euro (EUR) is likely to rise further against the Canadian Dollar (EUR/CAD) in the next few days, most immediately from the conclusion of the Greek bailout negotiations, either tomorrow or on Friday. German CPI Indices for July (due out tomorrow) are likely to support the Euro’s current rise if they exceed expectations, and although the Canadian yearly Housing Price Index for June is also due tomorrow, any positive effects may be eclipsed by the US Advance Retail Sales figure for July, which will surely devalue the ‘Loonie’ if predictions prove accurate. The Euro to Canadian Dollar (EUR/CAD) exchange rate was trending in the region of 1.4472 and the Canadian Dollar to Euro (CAD/EUR) exchange rate was trending in the region of 0.6911 today.